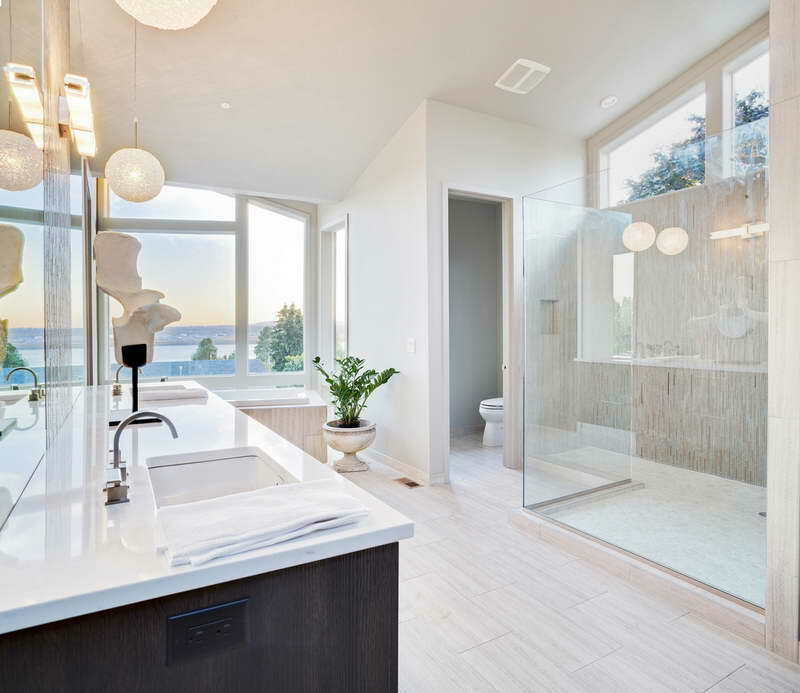 Setting your budget for your bathroom renovation can give you a realistic idea of what look you can achieve. The kinds of tiles, fixtures, and extras should be figured out after subtracting the costs of labor. It’s important to have a general idea of the look you are trying to go for – but the details of the materials should be figured out at a later point. Renovating an entire bathroom is not just a-few-days process. Depending on the size of the bathroom and how much work needs to be done, it can take up to weeks. It will also take time to order and purchase materials necessary. You should plan to have enough time not only for the duration of the remodeling works but also enough time to have all materials ordered and delivered by the time your contractor needs them. In places with a single bathroom, arrangements should be made so that residents can have access to a bathroom as needed. You have probably been thinking about this aspect for some time before deciding to remodel the entire bathroom, so the big picture is already there. The design style should coordinate with your budget and time frame, so make sure to take those factors into consideration. Don’t underestimate the amount of time needed for tile orders to be ready and delivered. Depending on the kind of tiles you want, orders can take up to 12 weeks to be fulfilled. Get your order in early so that you won’t be left waiting around for it to arrive. The same goes for fixtures. High-end products can take as long as 6-8 weeks so don’t procrastinate on these either. Here is where you can have all the fun – but don’t go too crazy because you still want to be within your budget. Pick a color scheme and shop away! You can choose your favorite towel bars, mirror, soap dish, and so much more. Work with our designers or your own or consult our experts to create the bathroom oasis you’ve been daydreaming about forever. Contact us today. Closets can be incredibly effective for storing everything from clothes and shoes to beach bags and outerwear – you just need to step away from basic closet designs and enter the world of custom closets in Houston. Follow this guide to help you design the perfect custom closet for your needs. The ideal closet for one person may not be right for you. Learn about a variety of storage ideas you can incorporate in your custom closet in Houston based on your lifestyle and personal preferences. Many of your desired closet features can be determined by your style identity. Shallow, velvet-lined drawers with separate compartments for necklaces, earrings and bracelets prevent your favorite jewelry from ever getting tangled again. An accessory rack can hold scarves, belts and long necklaces. Adjustable shelves can hold purses, sweaters and other bulky items you don’t want to hang up. Cubbies showcase your shoe collection. A shoe rack close to the ground keeps shoes off the floor. A tie rack organizes belts and ties to make them easier to find and help them last longer. Shallow drawers store socks, undergarments and baseball caps out of sight. Slide-out baskets can hold sweat pants, running jackets and other sports accessories. If you share a closet with your significant other, consider taking one side while your partner takes the other to prevent stepping on one another’s toes. With various features in mind, it’s time to determine how much space you actually need to store you and your partner’s clothes, shoes and accessories. Finding custom closets that meet your needs is a bit of a balancing act. Each type has it’s own specific pros and cons; but here are a few features to think about! A large walk-in closet in the master suite is of course ideal. The size can still vary dramatically, from a few square feet to the size of a spacious bedroom. The larger your walk-in closet is, the more important dividing the space into separate zones becomes. For instance, you should designate higher, harder-to-reach places for seasonal items that come and go. The level that sits right at your waist – also known as the “hot zone” – is the ideal place for things you access the most, such as shallow drawers holding socks and undergarments. Finally, you want to keep the floor space open for storing shoes. If you have the space, your walk-in closet could certainly benefit from a center island. This increases storage and gives you a convenient place to set out clothes and accessories for the following day. When you have limited space or fewer items to store, a reach-in closet is appropriate. While a classic reach-in closet contains nothing more than a hanging rod and a shelf, you can install a custom closet in Houston to contain so much more. Cube organizers, drawer units, adjustable shelves and multiple hanging rods help you maximize storage space in a smaller reach-in closet. You can even make use of the door itself by adding hooks to hang jackets on or over-the-door shoe racks to free up space in the rest of the closet. With a knowledgeable closet designer by your side, you can get more out of your reach-in closet than you ever thought possible. Find Closet Systems That Work for You. From inexpensive do-it-yourself closet systems to custom wood closets complete with detailed millwork, you have a wide range of systems to choose from. Possibly the most basic and affordable closet organization system, the Coated Wire Closet System is easy to install and generally offers limited versatility. This economical choice is versatile and widely available from the home improvement section of your favorite big-box store. Wire provides good air circulation and is easy to clean, but it has the appearance of being cheap and temporary. You can also have custom coated wire closet systems done; however, many designers recommend against investing in the money for that. I would definitely recommend saving for a dream closet if you’re like me and you love organized and luxury spaces in your home. For just a little more money, you can opt for a Melamine Closet system that gives the appearance of a wood stain without the cost. Melamine’s are a great cheap alternative to a custom wood closet. Similar to a laminate floor, Melamine is made of resin-coated particleboard or fiberboard that gives off the appearance of painted or stained wood. This is another economical choice – and most would argue a more attractive one than wire closet systems – but the quality of melamine varies. It’s really important to sample building materials that your contractor proposes for a project like this, so that you don’t end up with a lack-luster design. Thicker boards and thermally infused products (as opposed to cold-pressed melamine) are preferred. With a melamine you can save on the cost of building your closet and get alternatives to wood systems. Not only that, but you can somewhat tailor and customize what your finish looks like without spending huge amounts of money. Melamine closets in Houston, much like custom wood closets, can be customized and drawn up in a huge variety of shapes and functions. You can get custom shelving arrangements, drawers and cubbies included making them a crowd favorite. When money isn’t a huge object, the favored option for a custom closet is to get custom wood closets. Having a custom wood closet in Houston not only raises the value of your home, but it creates an inviting, luxurious feeling space that you’ll almost never want to leave. Known for it’s durability and quality, natural wood built closet systems last the longest and resist ware and tare the best. Perfect for even custom kids closets, natural wood is a great way to build a dream closet that you know will last forever. Wood closets are also preferred because of their strength. Your contractor can build in a seemingly endless array of add-ons to a wood closet without fear of structural instability. Shop-built wood closet systems are the most attractive option, with features to rival your kitchen cabinets or living room entertain center. While custom wood is the most expensive option, quality hinges, durable shelves and advanced features make it by far the most desirable. Browse the web to discover different types of closet designs. Let these images inspire you as you plan your dream closet. Print off a few of your favorites and take them with you when you meet with your custom closet designer in Houston. This ensures everyone is on the same page about what you want the finished product to look like. When you’re ready, please contact Natural Stone Gallery. We can help implement the closet styles, features and organization systems you need to make the most of every closet in your home. Carrara Marble vs. Calacatta Marble: What’s the Difference? Have you always marveled at the beauty of marble? This hard metamorphic stone is characterized by natural veining, which makes each slab as unique as your fingerprints. If you’re interested in incorporating marble into your Houston home, use this guide to help you differentiate between two of the most popular types and decide where you might want to use them. The first step is to narrow down the color of marble you want. If you have your heart set on white marble, you’re not alone. 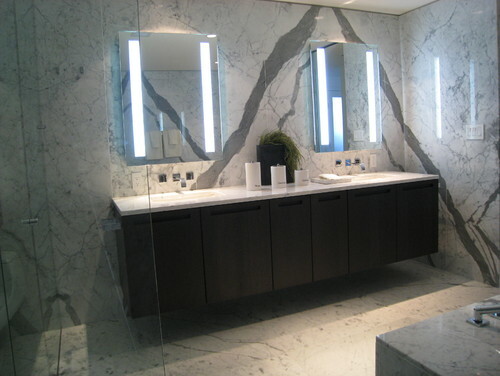 The look of white marble with gray veining is both classic and chic. This natural material has been used in homes and public buildings for centuries. It’s a status symbol that has luxury written all over it. Now, you must understand that there are actually two types of white marble: Carrara and Calacatta. Learn the difference between the two so you can decide which will work best for your Houston home renovation. This type of stone is quarried in the city of Carrara located in the northern tip of Tuscany, Italy. It has been used in building projects and sculptures since Ancient Roman times. Some notable buildings that include Carrara include the Pantheon, the Peace Monument in Washington DC, the Marble Arch in London and Harvard Medical School. Michelangelo’s David statue was also carved out of Carrara. While there is a lot of variability within both types of white marble, Carrara tends to be grayer in color with soft, feathery veining. Often, the veins are linear in nature, giving the marble a more orderly appearance. Sometimes, Carrara marble showcases dramatic veining, as seen here, but you can still tell this is Carrara because the stone is a darker hue and many of the veins are light and feathery. Choosing the gray-hued Carrara was a good choice in this kitchen because it provides a nice contrast with the white cabinetry. Where are the best places to use it? The soft veining and luxurious nature of Carrara makes it a great fit in a variety of applications. Still, because all marble requires more upkeep than other types of stone, it’s wise to avoid using it as a flooring material in high-traffic areas. Some of the most popular places to use Carrara include bathroom floors and walls, kitchen countertops, and fireplace surrounds. Calacatta is another type of Italian marble, much of which is quarried in northern Tuscany alongside Carrara. This is just another reason why people often mix up these two types. Variations in appearance occur with every slab of Calacatta, but in general, this variety is whiter with dark, more dramatic veining. The veins swirl around the surface of the slab in a much less linear fashion. Even within the category of Calacatta, there are subcategories that change the look of the luxury stone. 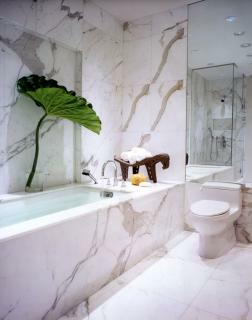 In this example, gold hues give the Calacatta marble a uniquely warm tone. Entire rooms can be covered, though this is easier to accomplish with tiles, as seen in the bathroom to the left. Because Calacatta marble is rarer and more expensive than Carrara, it may be wise to reserve this stone for smaller areas, depending on your budget. A vanity or island countertop, kitchen backsplash, fireplace surrouned, or shower wall are all excellent places for Calacatta to show off its quality. 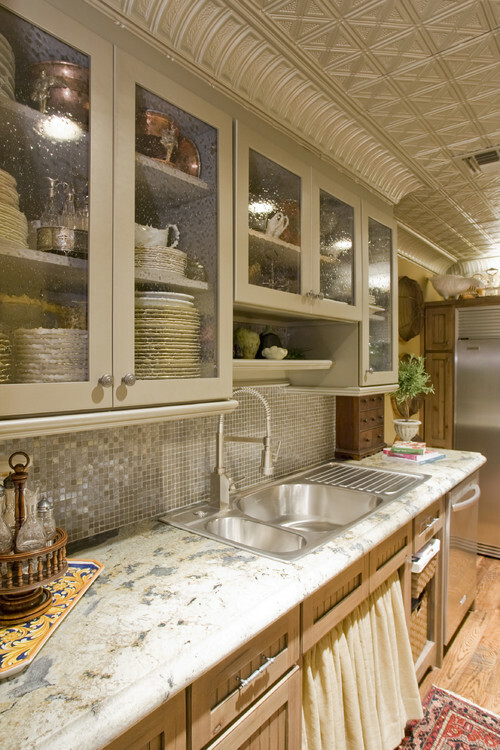 Have you decided which type of slab you want to use in your Houston home? Both Carrara and Calacatta could make a beautiful addition to your bathroom, kitchen or other room in your home. White marble is a timeless material with wide-ranging applications. 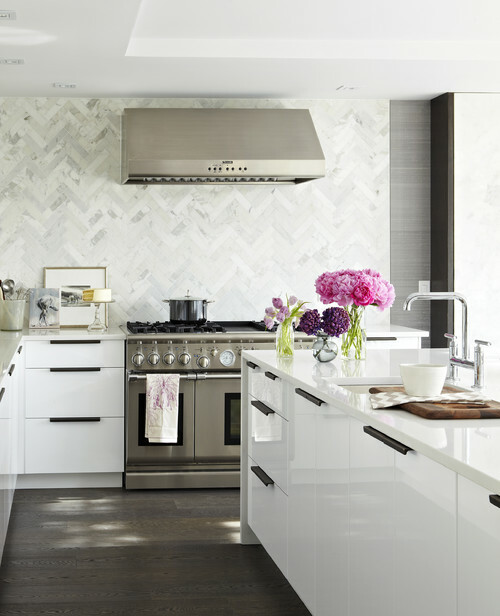 From classical bathrooms to contemporary kitchens, white marble suits a number of design styles and personal tastes. If you’re seriously considering white marble for your Houston home, follow these four tips to make sure it’s the right choice. Choosing white marble might sound specific enough, but there are actually two types. Carrara marble is grayer in color and has soft, often linear veining. If you like this look, Carrara may be the best choice because it’s less expensive and more readily available than Calacatta. Calacatta marble is whiter in color with more dramatic, heavy veining. This type of marble is rarer and considered even more of the luxury stone than Carrara. Polished marble features a high-gloss sheen for the deepest color and most beautiful luster. 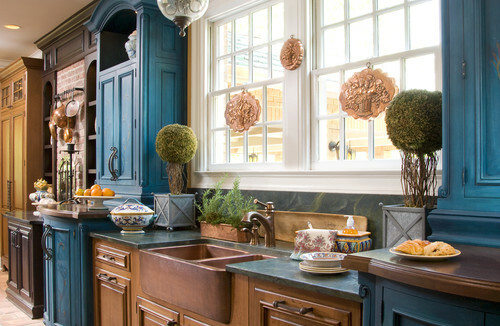 The polish makes the marble less prone to staining, making it ideal for kitchen countertops. Honed marble has a smooth, satin finish. To prevent staining, honed marble requires more frequent sealing. However, it does a better job of hiding flaws than polished marble. Marble in Houston doesn’t just give off the appearance of luxury and refinement; it requires this attitude from the people who have it installed in their homes. If you’re the type of homeowner who picks up after yourself immediately and works every day to maintain a clean and tidy home, white marble could be the perfect way to translate your lifestyle into your surroundings. However, if you’re more of a busy, on-the-go homeowner who places less of priority on wiping down the counters every day, marble could end up being more of a hassle than you bargained for. After all, marble is more prone to staining and etching than other materials. This means if you leave spilled acidic substances – such as wine, marinara sauce, lemons and blueberries – to sit overnight, you could end up inadvertently damaging your white marble countertops. Be honest about the type of lifestyle you live to help you decide if marble’s higher upkeep is worth it. Seal the marble: A sealer doesn’t protect marble against everything, but it gives you more time to wipe up acidic substances from countertops and floors before they can do any harm. A sealed marble fireplace surround also protects it against soot stains. Spot treat the marble: Only use spray cleaners made specifically for marble. These are available from home improvement stores and allow you to spot treat and seal marble as needed. Periodically rubbing down a marble countertop or bathroom floor near the tub and toilet helps prevent extra wear in these high-use areas. Move heavy objects carefully: Marble cracks and scratches more easily than other stones. If you install marble on the floor, be careful when moving furniture across it. Also, always use a cutting board instead of cutting directly on a marble countertop surface. Buff marble: If your marble has become scratched or etched, it’s not too late. Gently buff the surface to remove minor flaws and restore the marble to a newer appearance. With the right expectations and maintenance, marble could clearly be the perfect material to add to your Houston home!